Tribes Overall: "The holiday was beyond our expectations. So much wildlife. Good Safari tour co. We couldn't have asked for a better experience. " Tribes Service: "Our contact at Tribes was extremely helpful and very prompt in her response to our emails. " Guides: "Very knowledgable, good driving, took responsiblity seriously. The only very slight negative comment was their lack of interacion and general chit chat with the group. " The Managers were most helpful. Staff friendly. Good accommodation. Only let down was the food in the restaurant - Ok but not great, was expecting better quality. But the location of the Lodge being next to the river made up for it! 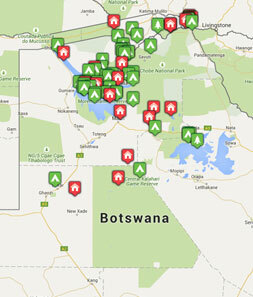 Excellent location to the Vic Falls. We would stay here again! "Camping next to a river bed and watching a herd of 28 elephants from young to old on the other side of the river. The elephants drank, played in the river and we watched them from the other side for 1.5 hrs. We couldn't believe we were there watching them - what an amazing experience which we will not forget!"